“We are very happy to have had our full house generator installed by Dan Entriken. If you want your generator installed in a top quality manner by someone who is always on time for appointments, gives a price quote that is clear and straight-forward, returns calls and emails promptly, and completes the job on time, Dan Entriken is the man for you”. “After the Super Storm Sandy (we were without power for 6 days) my wife and I decided to install a stand-by whole house generator. We live in a civilized world and 6 days without power is just unbelievable. We never want to go through that again! We wanted a generator that did not use gasoline so we would not have to line up in any gas station for gas. The best generator that we know of is a Natural Gas Generator. We searched the flyers/coupons that we previously collected and called up two installers who sold natural gas generators. Our regular maintenance guy who takes care of our A/C & Heating maintenance didn’t even return our call until the next day. Our refrigerator compressor got broken twice in the last few years because of frequent power outages in our area. The worst thing about an outage is that when power does resume, power often goes down again and then in 15 seconds (or even 30 minutes) it’s back on again which ruined the compressors due to the frequent sudden electrical power surges. My deep freezer got the same problem once. My A/C compressor got the same problem once, too. The repair cost for these appliances is just unbelievable. Also, we have had to throw away a lot of costly food that rotted in the refrigerator and deep freezer after returning from a long trip overseas because we discovered the electricity had been out at some point for an extended time while we were not here. “I lost power for 6 days back in 2011 when we had that blizzard around Halloween time. I bought a decent gasoline generator for about $1000 after that and I thought I’d be fine when Hurricane Sandy came along. Nope! Not only could I not always get gasoline for it, I found out it’s not great to use with most of the modern appliances in a home, which actually are quite sensitive. Almost everything these days has an on-board computer inside and these appliances need a very “clean” electric current like the power company delivers. I thought all electricity was the same, but it’s not. You need to talk to an electrical engineer to figure some of this stuff out because nobody ever explains these things to you. My high-efficiency furnace has a computer circuit in it and even though I got the furnace running on the gasoline generator after Sandy hit (by making a very dangerous connection to it with open wires and an extension cord), the furnace made all kinds of strange noises whenever it ran. (I couldn’t run it for all of the 7 days we had no electricity because I didn’t always have gasoline to use!). My family could either be cold all night, or I could risk burning out the furnace controls; neither option was very appealing. I really hope I have not damaged the furnace as that thing will cost me thousands of dollars to replace. It turns out most gasoline generators put out a very “dirty” electric current that can fry up sensitive electronics. If you want “clean” electricity from a gasoline generator, you need to spend many thousands of dollars to get one that puts out the same quality of electricity as the power company; the generators you buy at a hardware store are not really designed to run sensitive computerized electrical devices. They are fine for ordinary light-bulbs or even a basic sump pump, but not right for most of what you have plugged in at your house. You can burn out a brand-new flat screen TV in seconds because the electricity coming out of most gasoline generators is full of static and spikes up and down! 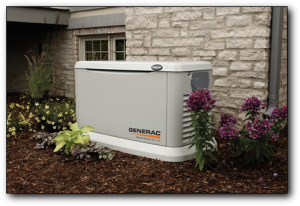 “HD Services installed the home generator for my friend in December 2012, after NJ was badly hit by Sandy. My friend was very happy with Dan’s service and he highly recommended him to me, so in March 2013 I met with Dan. The meeting with Dan went very well, he’s very knowledgeable and helpful, and he answered all the questions that I had. His price quote was very reasonable, so I went ahead and signed the contract with him. The generator was ordered and even though it was delayed due to Generac being back-ordered across the country; Dan wasted no time, he worked with the borough and obtained all permits and documents that were required for the installation so we’d be ready as soon as the generator arrived. He kept me advised of everything that was going on with my order so I never had to wonder about anything. Very soon after the generator was delivered, Dan had it completely installed and then scheduled all the inspections by the town building department. Everything went smoothly and I am very happy with the generator and the work Dan carried out !! • Dan is very knowledgeable and pays attention to small details. • He is very helpful and considerate, he even helped me move around heavy furniture in my basement to free up room for installing gas pipes and cables, etc. • Dan takes pride in his work. I am always thankful for the kind words my customers have for me and I hope what is written above gives you a better idea of who you will be dealing with. I’d like to add you to my long list of happy customers and protect your home from any future electrical emergencies. But it’s up to you to take the first step and contact me to set up a short meeting at your home to discuss all your possible options. Please contact me today.